Today, please welcome writer Fenton Johnson. Cynthia’s blog charged me with describing my day, but then I read Cynthia’s touching introduction with its mention of Fenton the Canine, and I found myself writing an obituary, and grateful to Cynthia for inspiring me to do what needed to be done. Ain’t that the way of life–some kind word or thoughtful comment, a bit of praise from a fellow traveler and suddenly we see what’s been begging to be seen all along. And so here is how I spent my day: composing a tribute to my namesake. I was walking with Pam Houston, the human, and I had been complaining. Non-Southerners do not realize that south of the Ohio objecting to the nature of reality is just a conversational mode–a way of making a particular kind of mouth music that is not intended to carry any larger implications about the speaker’s temperament or frame of mind. Many of the most light-hearted Southerners I know are the most eloquent complainers. Some of them find their ways to becoming writers. Anyway, I had been complaining about my sixteen nieces and nephews and my friends, none of whom had chosen to name any of their children after me. I would go to my grave without issue or marker, I said. Not long afterward, being the kind of friend she is, Pam announced that she was naming her next Irish wolfhound Fenton Johnson. I admit I was taken aback. I understood this to be a compliment of the highest order, and Fenton / Fintan, a name with deep Irish roots, was singularly appropriate. The first of the two Saint Fintans is revered as “Father of the Irish Monks,” and both ruled over monasteries in the glory days of Irish Christianity, well before the Roman Church suppressed its so-called pagan elements–nature rituals and goddess worship. All the same. A dog is a dog, when evidently I had set my perverse heart on an eponym and namesake attached to some creature of the two-legged variety, despite the overwhelming evidence of the moral superiority of canines. Wolfhounds, most particularly Irish wolfhounds, are a noble and enduring breed–when you see them in paintings and tapestries in the company of medieval kings and queens, the impression is of the royalty escorting the dogs rather than the reverse. But they have suffered the ravages of inbreeding, and as an emotional investment they are as risky as–well, as the men Pam writes about in her books. Some can be–let’s be generous here–learning challenged, and many develop bone diseases and arthritis early in their short lives. To keep company with Irish wolfhounds is an ongoing reminder that indeed our lives are as grass on the roof–an ongoing lesson in the symbiotic relationship between love and loss, life and death. But when the gene pool coalesces they are the noblest of hounds, and I know that I will get no argument from Pam when I write that in Fenton the Canine, the gene pool seriously coalesced. For starters, at almost eleven years old he was the longest-lived of Pam’s several wolfhounds, beating out even the remarkable Dante on this score. To watch him in his youth–or even in his old age–hit his long loping stride chasing sea birds on Limantour Beach was a q.e.d. moment, when the illusion of separation and the burdens of being a sapient homo slipped away and everything, sea, sand, birds, surf, dolphins, sky, humans, dog and the long perfect arc of Point Reyes curving toward sunset was one and whole and completely and fully integrated. No duality. We are all one in Christ Jesus. Like Pam, Fenton the Canine was a teacher, and like her, he taught through the simple fact of being who he is, who he was. What we have to be is what we are–thank you, Thomas Merton. “Life is the little that is left over from dying,” wrote Walt Whitman, our national prophet and saint. In the losses lie the lessons, I know that to be true, too. Put those statements together and you see that if we would embrace death as another aspect of life–if we would let the animals teach us how to live and how to die–we just might treat each other and our animals better than we do. A tribute to Fenton the Canine is of necessity a tribute to Pam, who brought him into my life, and who has the bigness of heart to admire and love and care for these beautiful bright short-lived creatures. It is hard to accept that, ojalla, the next time I walk on Limantour Beach, I will have to conjure Fenton the Canine in my imagination. And yet in the end I am glad to know and to write that glorious, useless art has a greater hold on me than practical fact, and that to live in the imagination is another way of living in what the saints and prophets call eternal life. The best book I’ve read recently is a tough question, because I read peripatetically, keeping multiple books at hand and browsing through them. (Evan Connell: “I don’t read for pleasure, I read for what I can steal.”) These are the books on my coffee table, right now, as I’m typing: The Oxford Annotated translation of the Bible (I recommend Genesis, Exodus, the opening and closing passages of Isaiah, the Psalms, and the Gospels). Maurice Manning’s The Common Man and The Gone and the Going Away. Barbara Kingsolver’s The Lacuna. Emily Dickinson’s complete poems. The American Library edition of the complete Zora Neale Hurston–I’m reading her memoir, Dust Tracks on a Road. In Flannery O’Connor’s A Good Man Is Hard to Find, the Misfit says of the Grandmother, “She would have been a good woman, if it had been somebody there to shoot her every minute of her life.” This, of course, is true of all of us, every single day, true of you, true of me. How we spend our days is how we spend our lives. So here is a prompt, a daily exercise, for you, for me: Next time we sit to the blank page or the keyboard, let us ask: How can we really see the gun pointed daily at the heart? Assume the loping stride of Fenton the Canine on Limantour Beach. Go looking for that place. Then write. 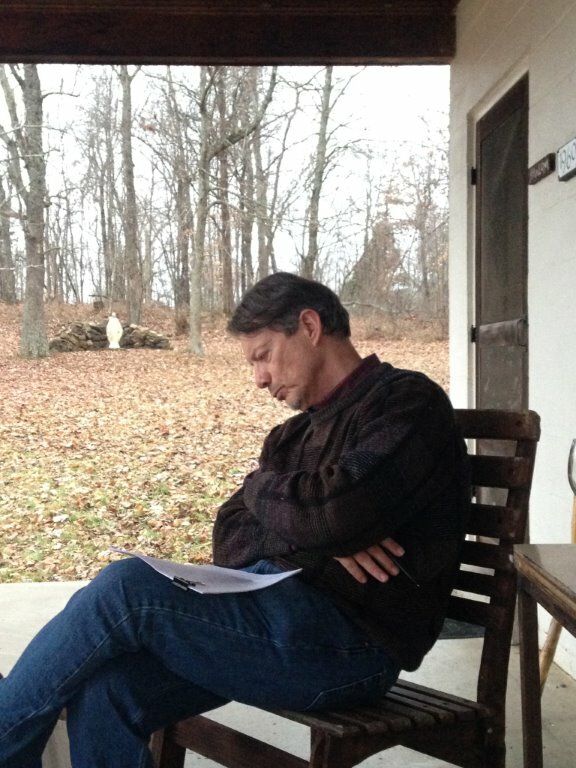 In the meadow in front of Thomas Merton’s hermitage, December, 2013. 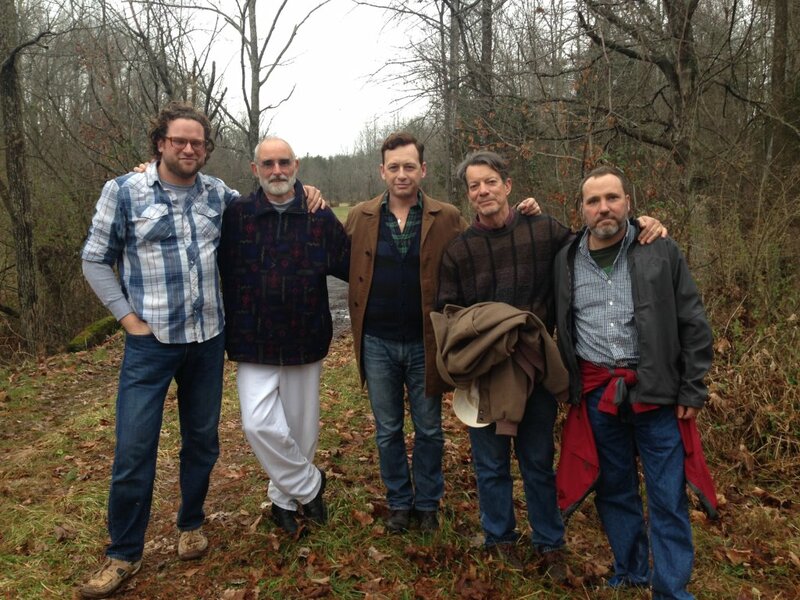 L to R: Dave Harrity, poet; Paul Quenon, poet, monk, teacher; Silas House, novelist and hell raiser; Fenton Johnson, wordsmith and proximate cause; Maurice Manning, poet. Photo credit: Jason Howard, writer and editor. By far near perfect advice…”Next time we sit to the blank page or the keyboard, let us ask: How can we really see the gun pointed daily at the heart? Assume the loping stride of Fenton the Canine on Limantour Beach. Go looking for that place. Then write.” I admire Pam (the human) to pieces. Wish I had met Fenton the dog. 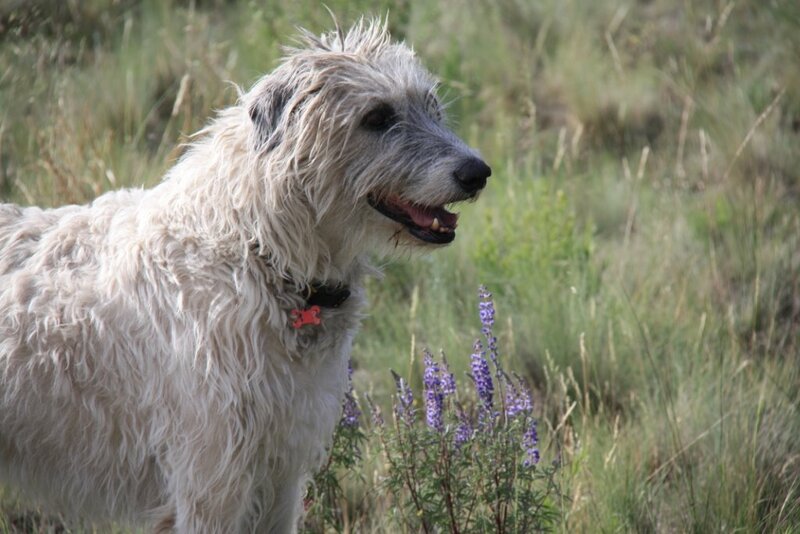 From following his passing on Pam’s Facebook page, I now have an Irish Wolfhound, Hawthorne, “loping” through my novel-in-progress, and a reference to one as a simile describing a teenaged boy in my latest story. Love dogs posts! More dogs posts! 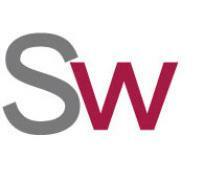 New title for blog…How I Spend the Dog Days. Grief can mute for long stretches, and I’ve yet to write about the recent loss of my once-stray, blind dog. Not blind from old age but born without eyeballs in her sockets. And yet, she fearlessly ran about my farm (even though she’d bump into things). Like Fenton the Canine, she taught by her amazing example. Fenton, your bitter sweet post made me smile. When I was growing up, our next door neighbor named her dog Sarah, not after me. It drove my mom crazy. Your Fenton seems more worthy of his namesake. What a gorgeous dog! I’ve loved and lost a couple of dogs myself. What I like best in your responses is how you redefined the questions to allow you to say what you wanted to say. Creativity has no limit. Cynthia, thanks for hosting! I hope your writing retreat on the Cape is/was productive. In the losses lie the lessons. I can’t stop thinking about this. Thank you for sharing. I love this. I loved that dog, too. Thank you. By chance, I read this first thing this morning, upon waking. It felt like a prayer. Like the most grounded and unreligious but divinely humane prayer. What a gift. 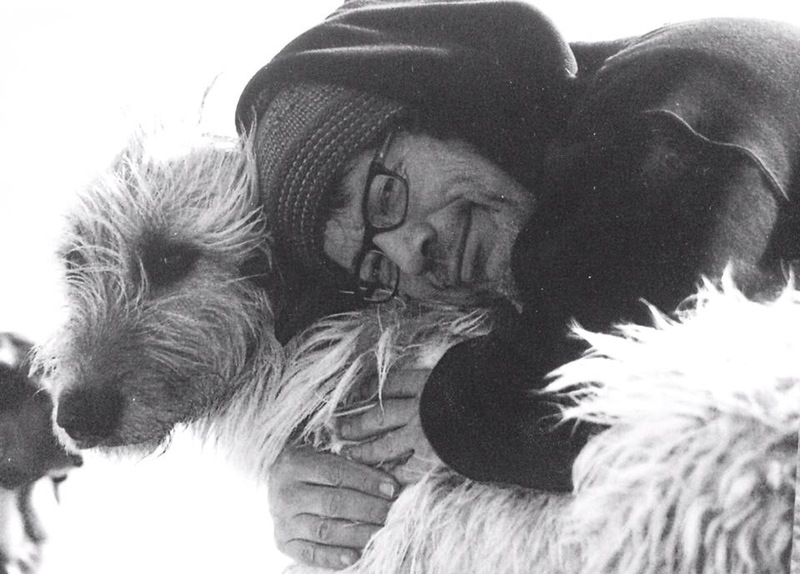 Thank you, Fenton the human, for this beautiful tribute to Fenton the dog, and to life itself. Absolutely wonderful. I shall point the gun. And continue to hang with our adorable mini-Schnauzer. Really so beautiful, so beautiful. Thanks to each of you–Jodi, Darrelyn, Sarah, Andrea, Patricia, BK, Dave, and lfj–for taking the time to leave a comment. Much appreciated. And from Fenton: For all who shared such kind thoughts, many thanks. More evidence of how we are all connected–by the Net, of course, but more importantly by our love for the created world and for each other.